Work on this gothic church, the largest church in Verona, begun in 1290, to designs by two Dominican friars Fra Benvenuto da Bologna and Fra Nicolò da Imola. Work continued through the 14th and 15th centuries, and was finally completed in 1481, although the façade was never finished. Sant'Anastasia was the name of the previous church on the site, built during the 9th century, and by tradition the church retains this name. From 1307 it was named after St. Peter Martyr, the co-patron saint of Verona, with Zeno, and the first Dominican martyr - an inquisitor assassinated by heretics in 1252. Not consecrated until 1471, the church was run by the Dominicans until 1808. The doorway has an arch of impressive polychrome marble. The white, pink and grey-blue colours are repeated in the marble floor inside. The carved panels in the architrave directly over the two doors depict scenes from the life of Christ. The relief panels to the right depict The Martyrdom of Saint Peter Martyr and the Miracle of the Cloud which shaded the saint as he preached. The series was to have been continued in the empty frames to the left of the door. The interior, a nave and two aisles separated by six columns each side, strikes you first with the flower decoration of the vaulting. The oldest such ceiling decoration is from the 14th century and to be found in the transept and the first bay back up the nave, with the work getting later as the bays progress towards the back. On the first column on the left there's a hunchback supporting a holy water font which is said to have been carved by Veronese's father Gabriele in 1495 (see right). There is no documentary evidence for this, however, and it seems that the painter's father was a humble stonecutter, with his heightened status as a sculptor a creation of Ridolfi. The floor is original and is in the colours of the Dominican habit plus the blood of Christ (Verona marble). The position of the original tramezzo (screen) is visible in the messing up of the design on the paving across the church between the organ and the side entrance. The first four altars feature works by Francesco Morone, Nicolò Giolfino, Felice Brusasorci and Nicolò Giolfino again (The Descent of the Holy Spirit 1518) (with the lunette by Morone) respectively, and impressively. After the big gilt organ is the Rosary Chapel, built by Domenico Curtoni in the late 16th century to celebrate the Venetian victory at Lapanto which the Company of the Rosary fought in. 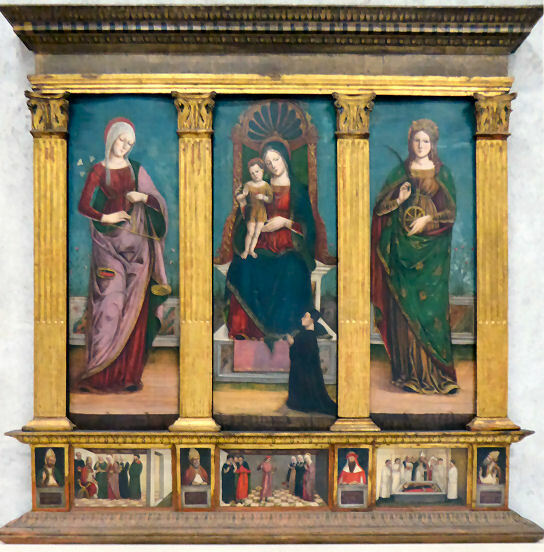 Two dark late-16th century paintings flank a lovely 1358/9 Lorenzo Veneziano altarpiece depicting the Madonna of Humility with Saints Peter and Dominic and Cangrande II and his wife Elisabetta (see far below right) formerly and traditionally ascribed to Giotto. Above there's a damaged dome painting, the Four Evangelists in the pendentives, and lunettes by Marcantonio Bassetti(?) 1586-1630 (The Assumption in the dome) a pupil of Felice Brusasorci. Hanging in the next chapel, the Giusti, through a doorway in the left transept, is a ship's rudder, a trophy from the Battle of Lepanto, as well as works by Brusasorci (the distant altarpiece) and Balestra. Also a fresco by Giovanni Badile. Various works around the doorway into the Giusti chapel, including a fresco of Jacopo Beccucci (in armour) presented to the Virgin Mary by the Second Master of San Zeno from the 14th century, whose fresco work is to be found in the first of the east-end chapels too, called the Salerni chapel, which is the base of the campanile. The second, Lavagnoli chapel has three vivid Mantagna-influenced frescos on the left wall by Falconetti. The lower scene Jesus entering Caphernum features a self-portrait of the artist with his brushes. The presbytery has, on the right, a Last Judgement full of congested queues by the Second Master of San Zeno and on the left the dominating Monument to Cortesia di Serego 1432 (see right) attributed to Pietro di Nicola Lamberti, with frescoes of city views, The Annunciation, and Saints Thomas Aquinas and Peter Martyr by the Venetian Michele Giambono. The whole is a multimedia feast of true fresco, a secco additions, painted stone, gilded pastiglie and silver laminate. The decoration of the ceiling vaults here was redone in the 19th century, the altar was refurbished in 1952 and the windows depicting saints are from 1935. The first chapel after the apse is the Pellegrini Chapel and is full of 24 terracotta reliefs of the Life of Christ, of 1436, originally polychromed, by Michele da Firenze, a pupil of Ghiberti. Over the arch to this chapel is the impressive Saint George and the Princess of 1434-38 by Pisanello (see above) commissioned in the will of Andrea Pellegrini in 1428. On the right side our hero is about to set out, watched by the Princess, whilst on the left (the other side of the arch) is the dragon, with the carcasses of animals that have been sacrificed to it. It has that characteristic courtly and tapestry-like look for which Pisanello is famous, and is worth all the neck-craning and binocular use you can manage. It is made of of 73 individual giornate, signifying a day's work. Many preparatory drawings for figures and animals here exist. Pisanello also painted figures of Saint Eustace (stroking a dog) and Saint George (sheathing his sword) on the left and right piers respectively. These were described by Vasari, based on information provided by Fra Marco de' Medici, a friar here, but they are now lost. Only three examples of Pisanello's work in fresco survive, and two are in Verona, the other being at San Fermo. The shield with the punning image of the pilgrim (pellegrino), below right, is also by Pisanello. This fresco was taken down in the late 19th century to be displayed more visibly in the Giusti chapel, and this process sorely damaged it, especially the gilding of the horse trappings and Saint George's armour. It was later returned to this position, but was also taken down for an exhibition in the Castelvecchio museum in 1947. The last chapel along the east end has, on the upper right wall, a fresco by Altichiero from 1370, the second of this church's must-sees. It depicts members of the commissioning Cavalli Family Presented to the Virgin by Saints George, Martin and James the Great. Altichiero's reputation rests largely on his work at the Santo in Padua, but Bernard Berenson in 'North Italian Painters of the Renaissance' expresses a distinct preference for the fresco here as a better indication of his skills. The other frescoes in this chapel are also 14th-century but are by other hands. All of the east-end chapels have iron gates preventing clear views of the frescoes. The Cavilli Chapel can be better appreciated in the watercolour (see right © The Victoria & Albert Museum) painted for the Arundel Society by Edward Kaiser. The end of the right transept has the very decorated altar with Girolamo dai Libri's very Mantegna-influenced altarpiece of 1502-5 depicting the Madonna and Child Enthroned with Saints Augustine and Thomas Aquinas and the donors Cosimo Centrego and Orsolina Cipolla. The painted and coffered surrounding Roman-style architecture reflects that of the painting. 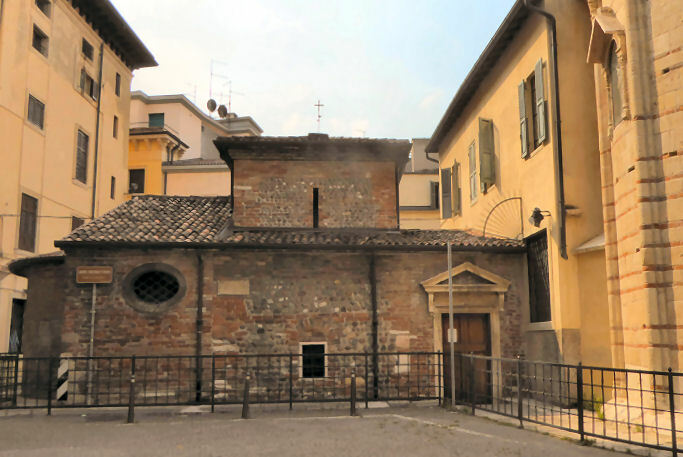 The next, Crucifix chapel is said to be the oldest part of the church being the site of original Lombard church dedicated to Sant'Anastasia, but it doesn't look it. To the left of the side entrance, above the confessional is an odd but Bellini-ish Mary Magdalene with Saints Catherine and Toscana of c.1491/2 by Liberale da Verona, (see right) who had been a pupil of Vincenzo di Stefano and of Jacopo Bellini when the latter had been in Verona in 1463 working in San Niccolò. (It used to hang in the third chapel on the right here, with other works by the same artist. This chapel now houses an 8th-century sculpted group of The Immaculate Conception taken from the church of Santa Maria di Chiavica). The next altar, the Pindemonte, is a grand and classical tribute to Verona's Roman Arco Gave by Maestro Francesco. Its altarpiece is a somewhat stiff Saint Martin and the Beggar of 1470 by Gianfrancesco Caroto, who had been a pupil of the just-discussed Liberale, who is responsible for the fresco lunette of c.1490 of The Deposition over the next, sculpted Bevilacqua-Lazise, altar. The final Fregoso altar, a memorial to Giano Fregoso, was carved in 1565 by Danese Cattaneo, a pupil of Sansovino, admired by Vasari. This side's 'hunchback' supporting the holy water font dates from 1591, a century after the one opposite, and is the work of the oddly-named Paolo Orefice, whose last name actually means 'goldsmith'. Both of the hunchbacks were actually probably workers from the many mills along the Adige river nearby. Finished in 1434 and un-Veronese in its being topped by a terrace and a ribbed cone and lacking pinnacles. There was a church here in the 12th century but the building we see today was begun in 1275. Enlarged by Augustinian monks, the new church was consecrated in 1331, but before the end of the century had already been further enlarged. In 1361 Diamante dal Verme paid for the chancel to be rebuilt, with a Gothic altar. 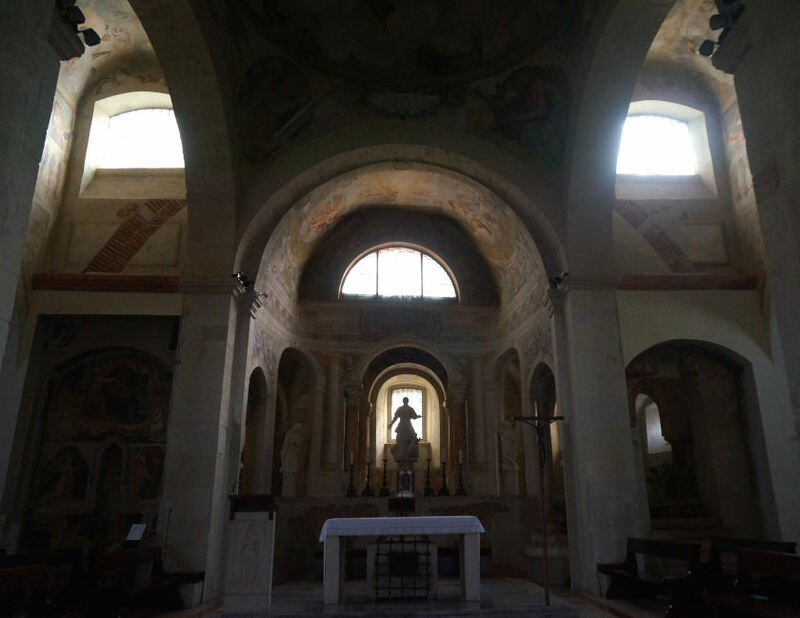 In 1390 the Spolverini Chapel was built under the supervision of Nicolò da Ferrara who had worked on parts of San Zeno. 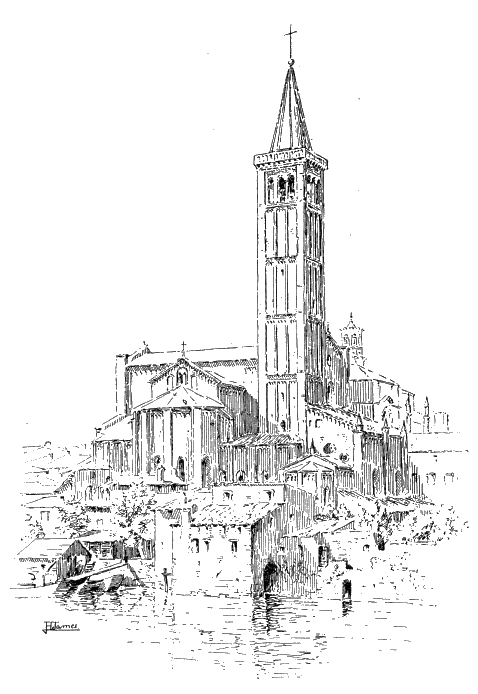 The church was said to have been a favourite of Dante during his years of exile in Verona. Typical Veronese Gothic exterior with added renaissance-era lancet windows and a pale marble doorway installed in 1424. A huge but aisleless church with what might be called a depressed barrel-vault ceiling. There are seven shallow and ornate altars down each side of the nave. A screen dividing the apse from the nave was removed in 1602. The current interior derives from a Baroque rebuilding of 1739 by Fra Pellegrino Mosconi. The chancel is still Gothic in effect, but even here Mosconi raised the floor. There are windows up on the right but they're blocked in opposite. The side altars now have panels with the names of artists and subjects, and are numbered in reference to a leaflet provided, in Italian. There are some impressive altarpieces by the likes of Torbido (Saints Barbara, Anthony Abbot and Rocco), Domenico Brusasorci (a Virgin and Six Saints), his son Felice Brusasorci (The Crucifixion, small and high up left of the entrance), and Giovanni Domenico Cignaroli (Madonna and Saint Thomas of Villanova) from the 18th century. The crossing is a shallow transept effect with a very deep apse with a modern decorated ceiling and two flanking chapels entered through doors. The left side has the organ, the right arm has a very damaged fresco of the Coronation of the Virgin detached from the wall outside, with it's sinopia displayed in the chapel beyond, the highlight 14th century Spolverini chapel, which is very decorated and retains its Gothic feel (see angel panel right) with early renaissance fresco work by Gian Francesco Caroto (see below). These frescoes depict stories from the Journey of Tobias. There is also a tryptych by him of Three Archangels flanked by panels of Saint Lucy and Saint Apollonia. The central panel is a copy, the original being in the Castelvecchio. The Augustinian monastery originally had two. 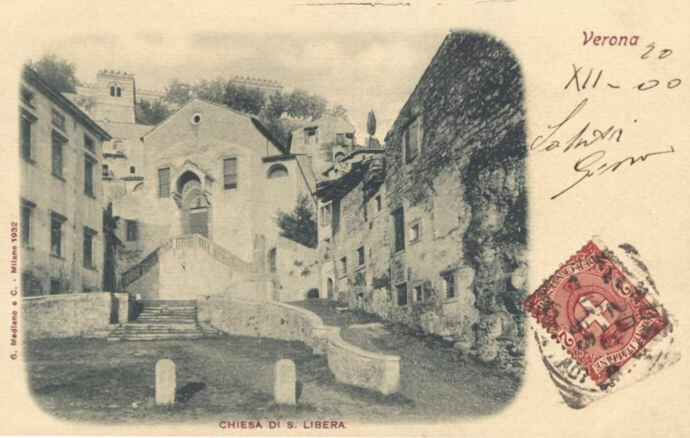 The one that remains, reached through the door to the left of the church, was rebuilt by Lelio Pellesina in 1636 (see below right) and is now used by a school. The panel with Three Archangels (1520) by Giovanni Francesco Caroto is now in the Castelvecchio. The painting over the altar in the Spolveroni chapel now is a copy. Eight damaged 14th century fresco fragments from the cloister here are in the Castelvecchio - a Crucifixion, attributed to the Maestro del Redentore, parts of two panels of the Madonna Enthroned, two fragments of saints by the First San Zeno Master, and three heads by the Circle of the Second San Zeno Master. Predella panels showing scenes from the Life of Saint Barbara by Nicola Giolfino are now in the Castelvecchio. ...having been commissioned by the men who governed the Company of the Angel Raphael to paint their chapel in the Church of S. Eufemia, he executed therein two stories of the Angel Raphael in fresco, and in the altarpiece, in oils, three large Angels, Raphael in the centre, and Gabriel and Michael on either side, and all with good draughtsmanship and colouring. He was reproached, indeed, for having made the legs of those Angels too slender and wanting in softness; to which he made a pleasant and gracious answer, saying that even as Angels were represented with wings and with bodies, so to speak, celestial and ethereal, as if they were birds, so it was only right to make their legs lean and slender, to the end that they might fly and soar upwards with greater ease. Monastery of Saint Catherine at the Wheel was built at the beginning of the 16th century, with the purchase of some houses along via Marconi, but it is only in 1563/4 that after buying other buildings that dormitories, etc, and the church was built. The church was consecrated on January 23, 1564. The church had three altars, the greater dedicated to Saint Catherine, the others dedicated to Saints Martin and Ursula. The church and the monastery underwent rebuilding in the 18th century, with a baroque façade designed by architect Giuseppe Montanari, while the monastery was restored by the sculptors Angelo Finali, Ambrogio Pagani, Pietro Maderna and Giuseppe Rangheri, the painter Michelangelo Prunati, the stuccoist Giuseppe Antonio Galetti and the masters Giovanni Pozzo and Pietro Pozzo. The altar was also rebuilt at this time, to be more monumental. The Mystic Marriage of Saint Catherine with Saints Rustico, Martin, Lucy, Zeno and Fermo (The Seven Saints Altar) attributed to the Maestro del Redentore (see below right) and The Thirty Bible Stories panel, are both from the early 14th century and now in the Castelvechio. The Thirty Bible Stories include some unusual scenes, some from the apocryphal gospels, including The Virgin praying at the Temple while her companions spin (see below). A still-polychromed statue of Saint Catherine from the church here by the Master of Sant'Anastasia (see right) is in the Castelvecchio. 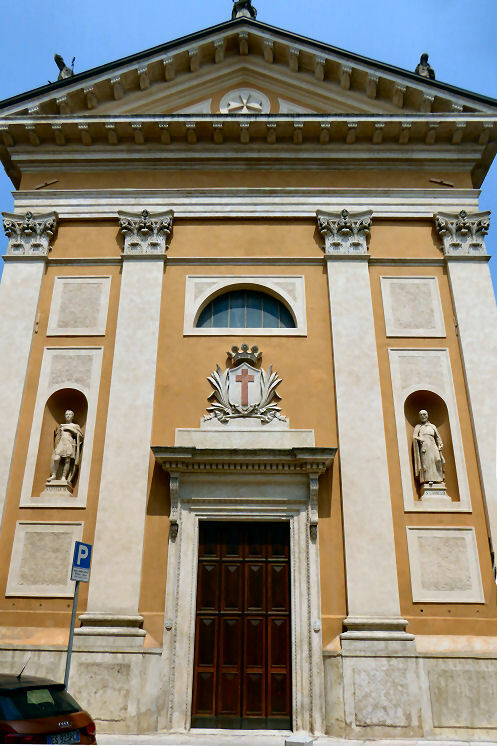 The church of Santa Cecilia was built on the site of the building now at number 9 vicolo Santa Cecilia. The earliest documents date the church to the 11th century. Paolo Veronese married, Elena Badile here on April 26, 1566, she being the the daughter of the painter Antonio Badile, his first teacher. Suppressed in 1806, the church was sold to private individuals and in 1854 transformed into a house. From a door in the corner at no. 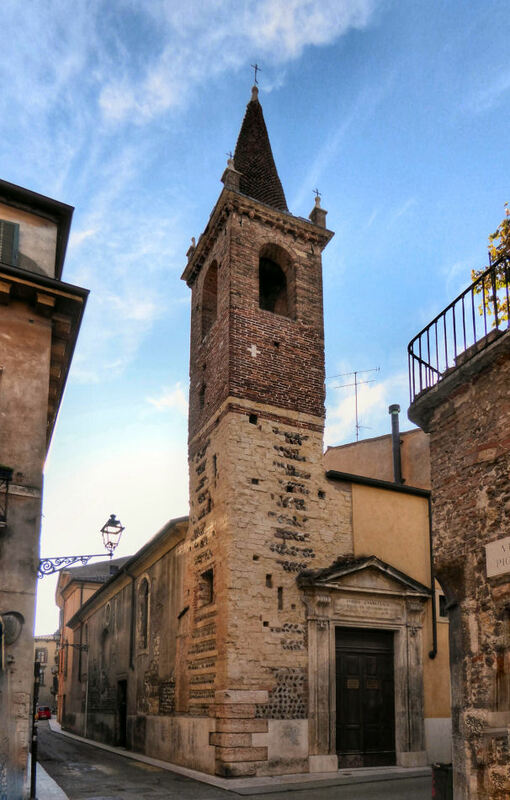 9 it's possible to access a small courtyard where the remains of the Renaissance sacristy and rectory remain, and the tuff and brick Romanesque bell tower still stands. The courtly Saints Cecilia, Tiburtius and Valerian triptych of c.1480 (see below) by Antonio Badile II (1424-c.1507) is in the Castelvecchio. The Acts of Saint Cecilia say that Valerian was her husband and Tiburtius his brother. Built from 1425 and until 1437, when use became possible, with the facade completed in 1453. 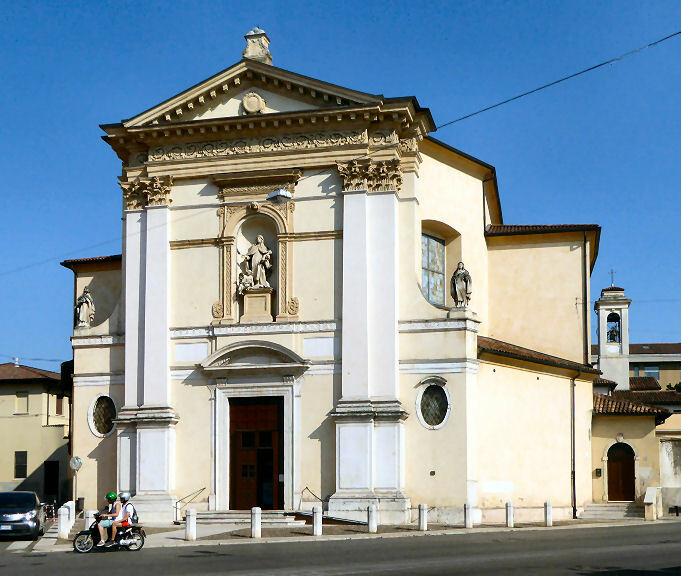 The church was consecrated by the Bishop of Verona, Matteo Giberti, on March 21st 1536 . Suppressed in 1810, church became a first a Napoleonic and then an Austrian military warehouse. In 1860 restored to nuns when major restoration work was started, with the final form given to the presbytery and a dome installed over the main altar. More minor restorations were carried out in 1897 (final opening of the two side chapels and floor reorganization) and in 1906 (termed at that time 'aesthetic massacre'). The church was reconsecrated on 2nd February 1907 . There are frescoes, dated 3rd August 1508, by Francesco Morone and Michele da Verona on the façade of a chapel. A sweet Mystic Marriage of Saint Catherine panel by Francesco Rizzo da Santacroce (recorded as in the sacristy here, and attributed to Cavazzola, at the beginning of the 19th century). Cavazzola's Incredulity of Saint Thomas painted for the convent here, along with two small panels, one showing The Archangel Michael and Saint Paul and the other Saints Peter and John the Baptist. Four panels depicting Saints Sebastian and Paul, Saints Anthony Abbot and Roch, and a panel each depicting Saint Bernardino and Saint Clare with devotees, believed to have come from the church or monastery here, and to be early works by Francesco Morone. They were said by Crowe and Cavalcaselle to be 'originally part of the organ'. An Adoration panel by Giovanni Francesco Caroto from the church or convent here. The first lay fraternity in Verona was established here in 1131. Twenty fragments of fresco 'brutally removed' from the walls here, depicting saints and martyrs, were sold to the Castelvecchio in 1879. They include the head of a woman by an artist from the circle of Francesco Moorone. Part of a very damaged panel showing the Madonna and Child with Saints Sebastian, Paul, Roch and Christopher by an artist from the circle of Nicola Giolfino is now in the Castelvecchio. The original church here was 7th century, and adjoined a convent. It was rebuilt in Romanesque style after the earthquake of 1117 and consecrated in 1185. The current building became the private chapel of Verona's ruling Scaligeri family. Outside is their famous family cemetery - the 14th century Scaligeri Tombs somewhat overpower this small church. It is enclosed by a wrought-iron fence featuring ladders, their family symbol, the name originally having been della Scala (of the steps). A design repeated in the iron work of the sanctuary gate inside. The exterior has bands of brick and stone with small windows. The side-door is dominated by the monument to Cangrande I della Scala, friend of Dante and patron to Giotto, who died in 1329. The equestrian statue of Cangrande is at the very top - it's actually a copy, since the original was moved to the Castelvecchio in 1910. It's by an anonymous Veronese master known as the Maestro delle Arche Scaligere. Below, just over the door, is the prince's sarcophagus, with his reclining figure, attended by his dogs. It's the first of the family's elaborate gothic monuments, the rest having been built in the adjoining family cemetery. Around 1630 the three-nave interior was rebuilt in Baroque style, but late 19th century work resulted in the restoration of the original Romanesque interior. 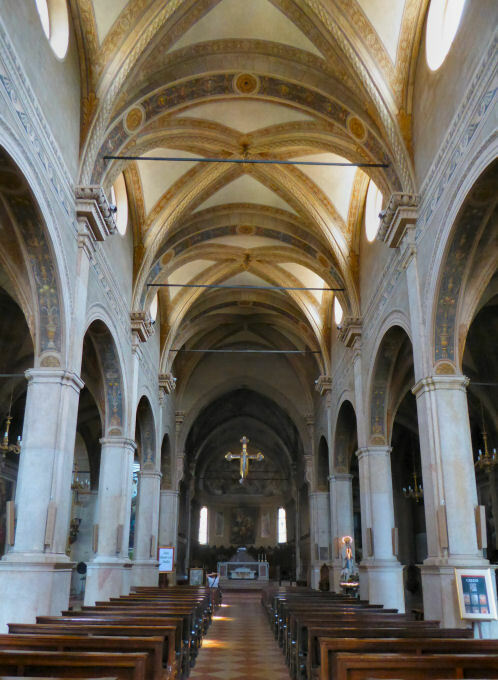 The interior is impressive - bare-stone, plain columns with square capitals - buff and very antico with brick-stripe walls (with pebbles) and a small nave and apse. The only survival of the original building is a fragment of black and white mosaic floor, to be found next to the altar under a small trap door. There is one small side chapel with a carved panel depicting the M&C and a decorated ceiling with a painted dove. There's a copy of Mantegna's Dead Christ and a fragment of early 14th century fresco in a niche behind the altar (see right). Positioned over the apse, a short brick Romanesque tower (with three baroque bells) with mullioned windows and a brick-covered spire. The four-sided tomb of Mastino II (Cangrande I's nephew and successor) which was built between 1340 and 1350 is just inside the gate. He lies on his bier with an angel at each corner. His equestrian statue on the spire was replaced by a copy in 1992, the original also being moved to the Castelvecchio. The even-more-ornate tomb of Cansignorio who died in 1375 is the work of the Lombard sculptor Bonino da Campione. The tomb of Giovanni della Scala who died in 1359 is the work of Venetian stone-cutters and is attached to the wall of the church, having been moved from the suppressed church of San Fermo al Ponte. The family palace is the building opposite. 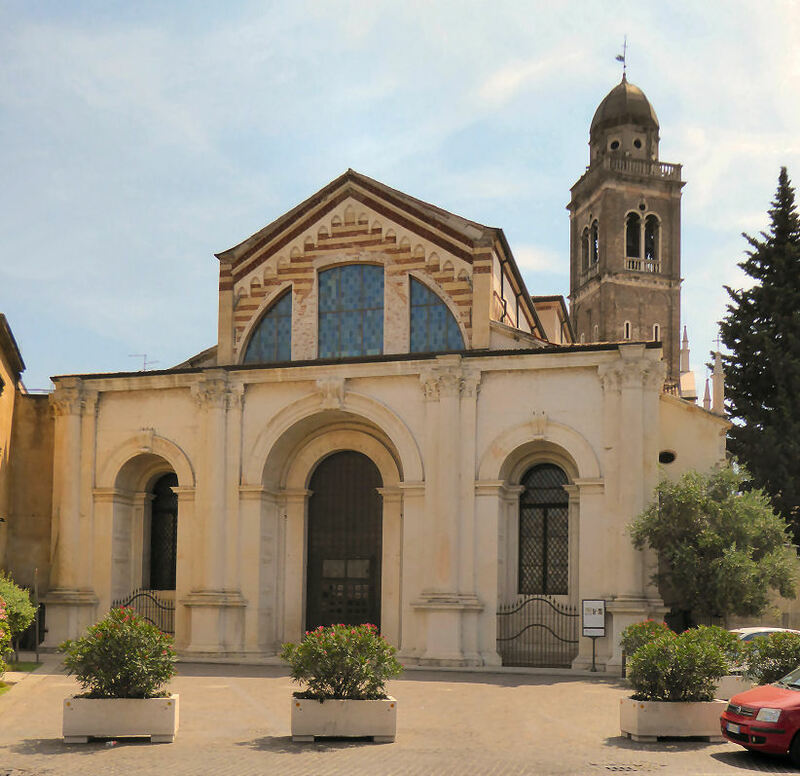 Tradition has it that this church was built towards the end of the 8th century, dedicated to Mary, the sister of Annone, the bishop of Verona, on his return from Istria , from whence he'd brought the relics of the Veronese saints Fermo and Rustico. 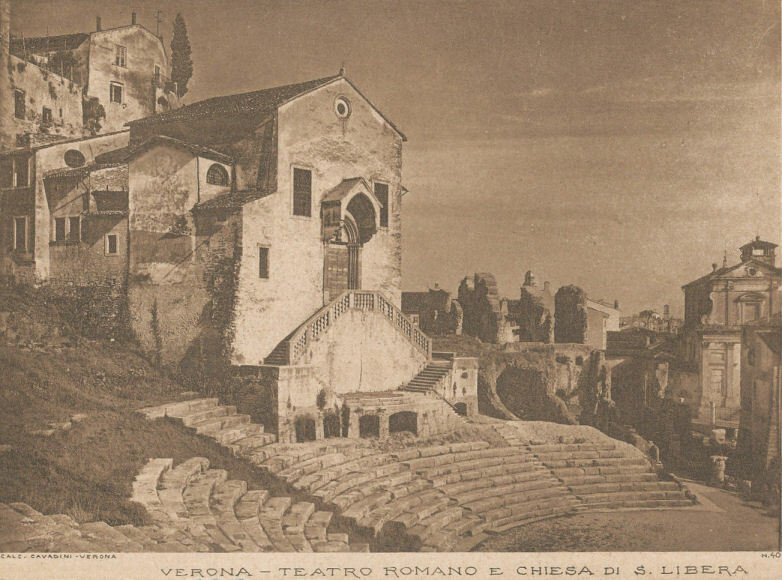 Upon his return with the remains a terrible drought that had struck Verona ended. Mary earned the name of consoler after his death and the church was dedicated to her. Traces of the 12th century Romanesque church remain. Bishop Tebaldo placed Mary's relics here in 1320, deceived in the smell of holiness, as Google Translate would have it, maybe the odour of sanctity sounds better. 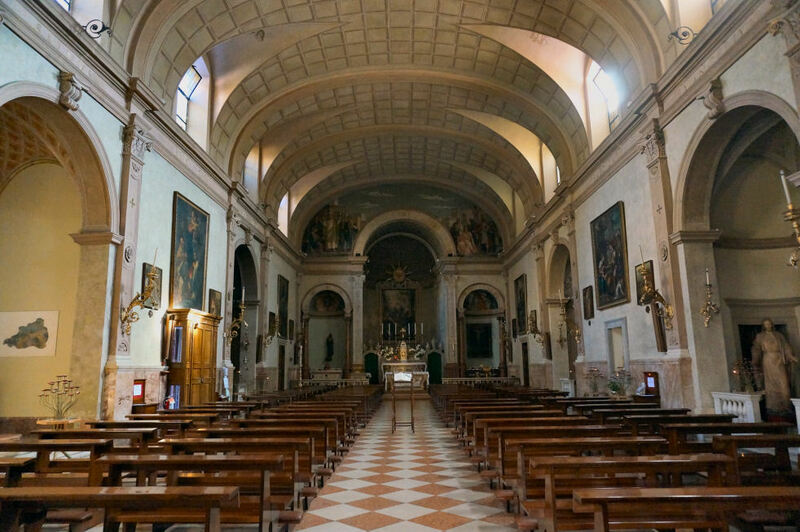 Until the 18th century, the procession, during periods of great drought, of the thorn with which Saints Fermo and Rustico had been martyred stopped here on its way from the Duomo to San Fermo. The abandoned church was bought in January 1879 by the Evangelical Waldensians. They restored the building and its original orientation (towards the Duomo) and the church reopened on January 6, 1880. The 14th century tombstone of Dinadato Spinelli is in the Castelvecchio. The Madonna and Child with Saints Mary the Consoler and Catherine (c.1485) by Antonio Badile II (see right) from this church, probably the high altar, has been in the Castelvecchio sonce 1812. This church was built over the too-small previous church of Sant'Apollinare Peccana, which was suppressed by the Venetians in 1517. Work began at the end of 1520. The church looked rough, externally, and remained so even after the first interior work of 1600. 1754 saw the construction of the triumphal arch and other work. 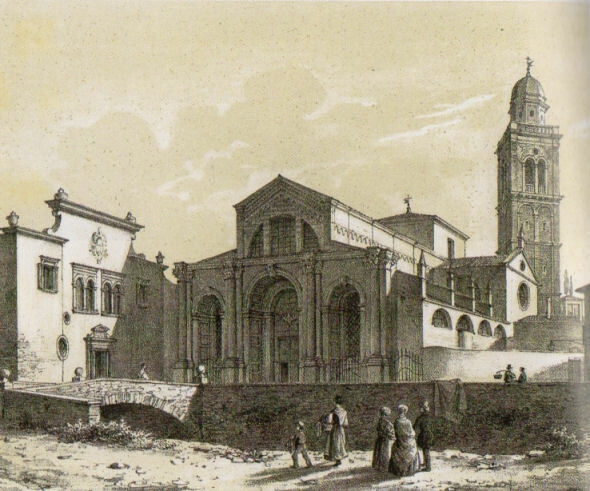 From 1782 to 1842 the church was renamed San Vitale, following a severe flood that inundated the parish of San Vitale. Not until 1896 was the unspecial temple-front facade built by the engineer Antonio Viola. In the two niches are statues of San Camillo and San Vitale. The high altarpiece, painted in 1565, is an Assumption by Farinati, and there are side altarpieces by Balestra and Farinati. A very large collection of relics is reported, too, begun by the founding Camillian fathers. 15th century and partially built from recycled gravestones. Built in 1325 by the Servite order (who had a few years previously built Santa Maria dei Servi in Venice) on land given to them by Cangrande I della Scala. The church was consecrated on December 6th 1329 with building continuing throughout the 14th and 15th centuries. From 1352 a second convent was built across the via Stella linked by a wooden-roofed passage which was destroyed by bombing in 1945, and by an underground passage. The bombing happened in January 1945, the bombs striking the roof, leaving intact the three apse-end chapels, the altar of the Madonna delle Grazie and the altar immediately opposite. The church was rebuilt, during which frescoes were discovered in the apse, and reopened in 1948. The only original parts are the outer walls as the interior was almost totally remodelled after WWII, with stout square pink columns set out from wall. Three chapels of varying sizes down each side. A deep apse and flanking chapels. The second chapel on right has a 14th century fresco of Madonna and Child with Saints John the Baptist and Zeno with presumed portraits of Mastino II (son of Cangrande I) and his wife Taddea da Carrara. The third chapel on the right has a Niccolò Giolfino Pentacost. Traditionally said to house the Confalonieri family tomb, it was only in 1907 that this was discovered to be the Guantieri family chapel, particularly notably that of Paolo Filippo Guantieri di Nicolò, a mayor of Florence who belonged to a family of bankers residing in San Marco. His will stipulated burial here pending construction of the tomb, for which he left 700 ducats. He left to his executors the choice of iconography. The execution of the will was opposed by his wife Antonia because of its legacy of 100 ducats a year for 12 years. In 1343 Giovanni Badile was hired to decorate the chapel with over thirty scenes from the life of St. Jerome . The story begins in the upper left and continues on the opposite side. Separating the two bays are the six prophets, while inside the arch is a Crucifixion with St. Mary and St. John, later replaced with a Pietà . The tomb is pretty spectacular but visibly missing the three figures from the three niches stolen by Napoleon. 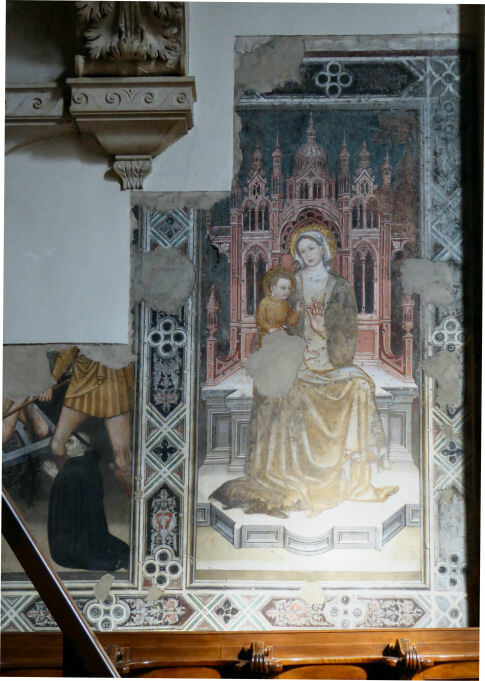 The apse has a high altarpiece of The Assumption by Felice Brusasorci and a very nice fresco fragment that the church leaflet wants to be by Badile too, or even Altichiero (see right). A panel of around 1520 by Liberale da Verona with the Adoration of the Magi on one side and Saint Peter on the other is now in the Castelvecchio. 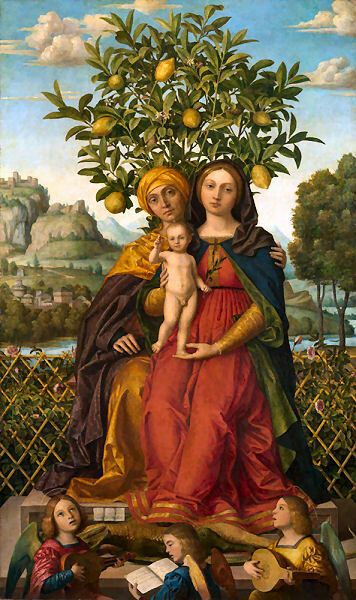 A Madonna and Child with Saint Anne (sitting under a lemon tree with a dead dragon and three angel musicians) (see right) by Girolamo del Libri of 1510/18 is in the National Gallery in London. It was the central panel of a triptych. The left wing by Paolo Morando, also in the National Gallery depicts Saint Roch, the other was painted by Torbido and showed Saint Sebastian but is now missing. Built between 1343 and 1345 the bell was bought in 1348 in Venice. There is said to have been an oratory on this site, founded in 813 by the Archdeacon Pacifico; but the earliest documented mention is to the 12th-century. Rebuilding work in the 15th century, by the 16th century it was affiliated with the nearby church of Sant'Anastasia. In 1807, following Napoleonic suppression, much of the art was moved there, and the church was returned to worship in 1832, as a subsidiary of Sant'Anastasia, until 1974 when it was used as a carpentry workshop. Restoration work more recently. 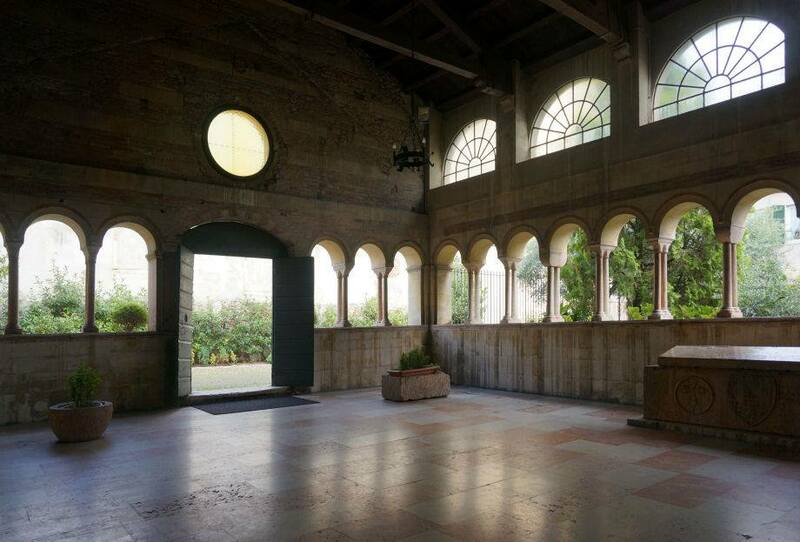 It is now deconsecrated and used for art exhibitions, theatre and events. The frescoes are by Girolamo Costantini. Remaining or lost are a Birth of the Virgin and a Nativity by Giovanni Battista Lanceni. In the second chapel is/was a Saint Francis of Sales and Saint John Nepomunk by Michelangiola Lanzeni. Also altarpieces by Eduardo Perini, Paolo Farinati, Pasquale Ottino, Giovanni Francesco Caroto, Michelangelo Aliprandi, and Francesco Turchi. A Madonna and Child with Saints Lawrence and Jerome panel by Giovanni Francesco Caroto, formerly in the Chapel of Saint Lawrence here, is now in the Castelevecchio. The original complex dates to the 7th/8th century - a Lombard-era monastery traditionally said to have been established with the will of Duke Lupo and his consort Emilenda. The church and monastery, then called Santa Maria in Gazzo, being rebuilt in 1131 after the earthquake in 1117, went into a bit of a decline, due in no small part to looting by the Scalegeri and Visconti lords. 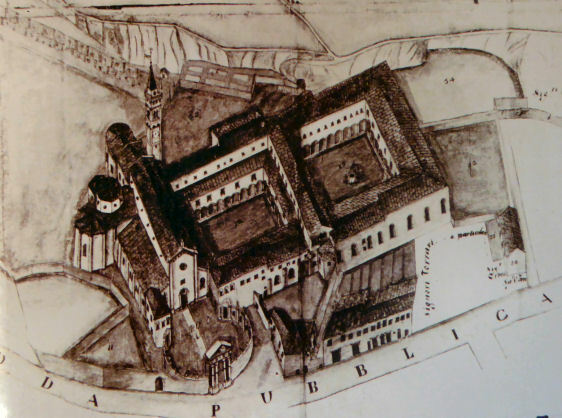 In 1444 the complex was sold to Olivetan Benedictines, led by Abbot Correr, who reversed the decline, rebuilt the monastery, the nave and lateral chapels and created the cloister, under the direction of Fra Giovanni, resulting in the church we see today and a new monastery. The scriptorium here employed Liberale da Verona in the 1490s and examples of his work can be found in various collections. The Benedictines remained until 1808 when the convent was suppressed and demolished. The name 'in Organo' is said to derive from an organum, a Roman tower used in irrigation, one of which was supposedly situated where the campanile is now. In 1547 the Renaissance marble façade was begun, designed by Michele Sanmicheli according to Vasari. It remains unfinished, allowing the upper part of earlier Gothic-Romanesque facade to still be seen. A Latin cross with a nave and two aisles and stout striped columns of alternating red and grey marble. Four quite deep and mostly dark chapels each side. Steps up to wide transept with a deep apse and two deep side chaps. 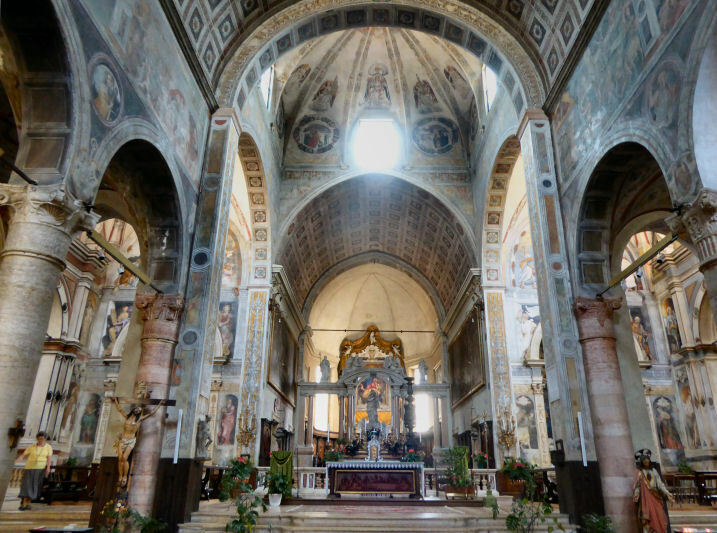 This is a large church with walls that are almost totally fresco-covered and is a bit of a pantheon, as it contains works by most of the foremost Veronese Renaissance painters. In the nave the frieze of frescos between the tops of the arches and the barrel-vaulted ceiling date to the 1530s. Those on the left, Stories of the Old Testament, are the work of Gian Francesco Caroto, whilst the right-hand panels of Stories of the New Testament, somewhat crowded compositions, are by Nicolò Giolfino. The first chapel on the right had the fine Nativity With Rabbits (now in the Castelvecchio) by Girolamo dai Libri. It now has a much later Madonna with Saints Catherine and Anthony by Balestra. The third has a painted wooden sculptural group scene featuring Christ & Mary which looks very like a trip to the dentist. First on left had? but now also has another Balestra. The transept is spectacular. The vault frescos are the work of Domenico Morone, with the help of his son Francesco. On the left are roundels depicting The Four Evangelists, on the right The Four Doctors of the Church. The central vault has Musician Angels with Bible figures beneath and an Annunciation over the apse arch. The chapel at the end of the right transept arm has the Archangels Michael and Raphael in a pair of illusionistic niches. Raphael's lower half was lost during bombing in in WWII, and post-war repainting was removed during the 1970s and during restoration in 1996 the affected area had a monochrome suggestion of the original appearance added. The chapel to the left of the apse (The Cappella della Maesta) has frescoes on the outer wall (of the Resurrection, two Sibyls, Saint John the Baptist and Saint Jerome) by Domenico Brusasorci. Inside is an altarpiece depicting Saint Benedict and the Miracle of the Resuscitated Child by Simone Brenta and wall and vault frescoes (The Miracles of Christ) by Brusasorci again. These were restored in 1993. The chapel to the right of the apse (The Cappella del Sacramento) has an Ascension on the outer wall, with Two Prophets by Niccolò Giolfino beneath and an Annunciation by Paolo Cavazzola beneath that. Inside is an altarpiece depicting St Helena Finding the True Cross by Brentana and wall and vault frescoes by Niccolò Giolfino. The apse has large flanking panels by Paolo Farinati with landscape scenes below by Agostino, Felice and Domenico Brusasorci. The choir behind has the famous and wonderful illusionistic intarsia work by Fra Giovanni da Verona from 1490s (see right). Fra Giovanni was an Olivetan monk here who received his training in intarsia in Ferrara from Sebastian of Rovigno. He worked in Urbino, Perugia, Spoleto, Rome and Venice before returning to Verona towards the end of the 1400s to produce his masterpieces in this church. His work is also to be found here on the cupboards in the very decorated sacristy (1519-24) praised by Vasari. The sacristy also has paintings by Agostino and Domenico Brusasorci (all twenty square landscape scenes on cupboards). The frescoes of Bendictine Popes (in the lunettes) and illustrious Benedictines (in white robes in the lower frieze, one of whom is Fra Giovanni by Caroto) are by Domenico and Francesco Morone, who also painted the ceiling, in which Crowe and Cavalcaselle saw a lot of Mantegna influence. The faces of the the illustrious members of the order were based, according to Vasari, on the faces of monks then in the monastery. Also an altarpiece of Saints Francis and Anthony by Alessandro Turchi (Orbetto). Under the raised presbytery is the crypt (with access from the apse) of the earlier church which retains some of the 8th-century columns and capitals and fresco remains. Also designed by Fra Giovanni, but not completed until 1533, after his death. It is thought that the remains of the ancient watermill which gave the church its name are to be found under the campanile. The wonderful Trivulzio Madonna, a Madonna and Child with Saints John the Baptist, Benedict, Gregory the Great and Jerome and Musician Angels by Andrea Mantegna (see below right), signed and dated 15th of August 1497, painted on linen for the high alter here. It is said to have been commissioned by Abbot Antonio Correr and is now in the Castello Sforzesco in Milan. The name comes from the Trivulzio Collection of Milan, to which it belonged from 1791 to 1935, when Prince Trivulzio's collection was given to the Sforza Castle gallery. Saint Jerome, at far right, carries a model of this church. Girolamo dai Libri and Francesco Morone collaborated on organ doors for this church in 1515, now in the Chiesa Parrochiale Marcellise near Verona. The two panels by Girolamo depict Saints Catherine and Mary Magdalene and the Nativity; the two by Morone are Saints Benedict and John the Baptist and The Prophets Daniel and Isaiah. They also collaborated on an altar frontal for the high altar and frescoes in the crypt and other works, now lost. Girolamo had begun his career here as an illuminator and Francesco as a painter. One of Girolamo's earliest known altarpieces is the Deposition with the Virgin and Saints Benedict, Scholastica, Helena, John the Evangelist and Mary Magdalene painted for the Da Lisca family altar here, with a view of Verona on a hill behind the cross (see photo far right). It was replaced by a Madonna by Balestra in 1720 and moved to the church of Santo Stefano in Malcesine, near Lake Garda. A panel depicting The Washing of the Feet by Francesco Morone of around 1503/5 is in the Castelvecchio. Three panels of episodes from the life of Lorenzo Giustiniani by him are in the collection of the Aurora Trust in New York. 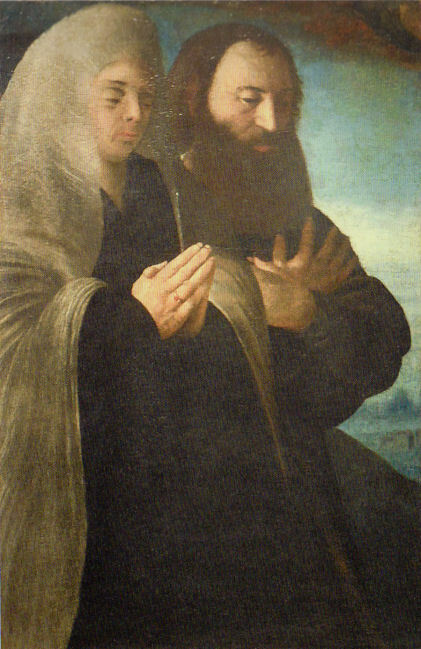 A Self-Portrait with his wife Placida (1530) by Giovanni Caroto (the brother of Giovanni Francesco) now in the Castelvecchio (see left) was part of an altarpiece destroyed by fire, showing the Madonna in Glory with Saints and the artist and his wife as donors. Vasari says that the altarpiece was in the chapel of San Niccolò here, which was frescoed by Gian Francesco, and was where the brothers were buried. It was Giovanni's uncle, Don Stefano, the cappellano (chaplain) here who left him a house and 500-1000 ducats, enabling him to devote himself to his studies, on condition that he married. Giovan Francesco Caroto was buried in the Madonna dell' Organo, in (his family) chapel of San Niccolò, which he himself had adorned with his paintings. The church once faced a branch of the Adige River called the Canale dell'Acqua Morta which was filled in in 1882. In the left aisle is a marker showing the scary height the water reached during the Adige flood of the 17th September 1882, the event which is said to have led to the filling-in. I assume that the churches will be open at other times too. Also known as the Church of the Scalzi after the Discalced Carmelites who built it. The order came Verona in 1663 and was initially housed in a Dominican monastery. They bought some buildings and the city gave them some land, and in 1666 they began building a church and monastery, to designs by Fra Giuseppi Pozzi. Construction wasn't completed until 1750, with the facade finished even later. Initially dedicated to the Virgin of the Annunciation and t he Archangel Gabriel, the order rededicated the church to their patron Saint Teresa of Avila. The monastery was suppressed on 8 July 1806 by Napoleon and used as a prison from 1883. The monastic buildings were destroyed by bombing in WWII. Octagonal with three polychrome marble baroque altars: the two side ones have twisted columns, grey in the left one, red on the right. The organ is over the door and the other four walls each have a confessional. The high altarpiece is an Annunciation, with God and putti observing from the clouds, an early and still quite baroque work (1697) by Antonio Balestra. The left-hand altar has a painted sculptural group, the right-hand a modern painting, featuring Saint Theresa I imagine, who was celebrating her 500th anniversary when I was here, in 2015. A Benedictine church was built here in the 11th century, adjacent to their cemetery, called Santo Sepolcro. In 1178 it was acquired possession of the Knights Hospitaller and the complex made into a hospital for pilgrims. 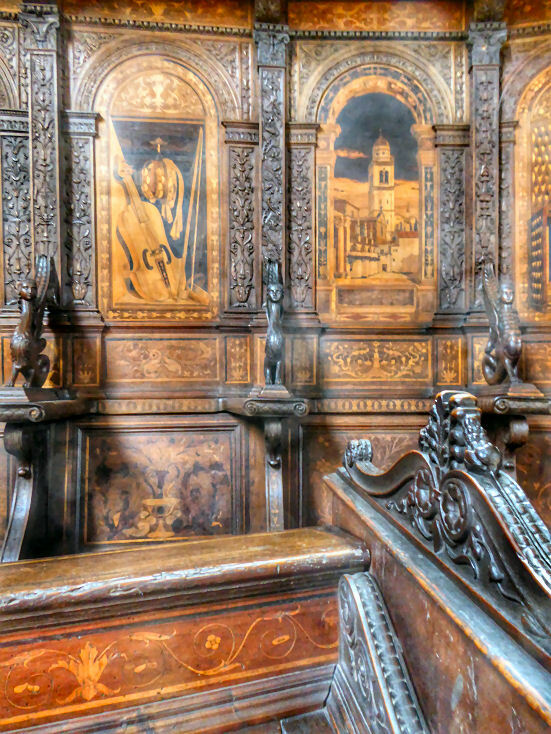 In 1342, they acquired the relics of Santa Toscana which were placed behind the main altar. Restoration work from 1482 left it with two aisles and an unfinished third aisle. 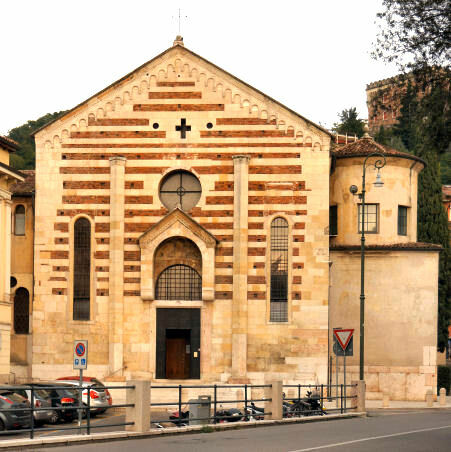 The church was consecrated by the Bishop of Verona on November 29, 1489, when the church's named changed from the Holy Sepulchre to Santa Toscana. No work since except for restoration done after the bombings of World War II. 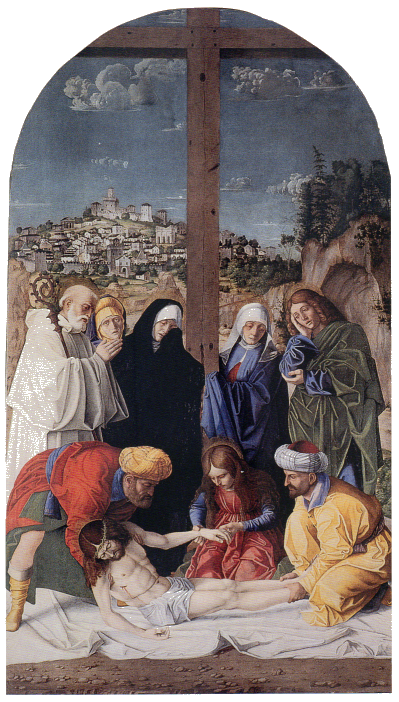 Contains works by Liberale da Verona and a sculpture group of The Lamentation, or Christ being placed in the Sepulchre 1502/4 by Giovanni Zebellana. The original church on this site was built in the 5th century which makes it, along with the adjacent Chapel of Saints Theuteria and Tosca, part of the oldest Christian complex in the Veneto. The surviving Romanesque elements date from a 12th century rebuilding, consecrated on 12th March 1194, after the earlier church was destroyed by the 1117 earthquake. Work in the 16th century made the church taller, as is shown on the exterior by the yellow plaster on the top half of the church, above the stone and brick layers of the original church, This work also reduced the interior to a single nave and removed the balconies for the female members of the congregation. The church was very damaged during a bombing raid on 14th January 1945. After the attractive exterior and campanile the interior is somewhat dull - aisleless with what might be called a depressed barrel-vault ceiling, and four largish side chapels, the frontmost pair domed and more ornate. A Giotto-ish processional Crucifix of the 14th century in the first chapel on the right. Works by Felice Brusasorci (an Adoration of the Magi), Turchi, Cignani, Ligozzi and some remains of 12th /13th century frescoes. Finished in 1110 and made of brick, tufa, and cobbles taken from the bed of the Adige. was here in the 5th century and consecrated in 751 making it one of the oldest church in the Veneto region. Originally Greek-cross shaped, as it was a funerary chapel, it attained its current form when it became the Bevilacqua family chapel in the 14th century. It is below ground level, with its floor two meters lower than that of the church of Santi Apostoli because that was the the street level in Roman times. In 1160 during reconsecration the bodies of the two saints were found, it is said, and placed in a red marble tomb. To the right of the altar is the tomb of Francesco Bevilacqua, consigliere to Cangrande II. Presented for exhibition and sale in late 2018, The Book of Saints Theuteria and Tosca is also lusciously illustrated in a book/catalogue called Four Remarkable Manuscripts from the Middle Ages, with text by Christopher de Hamel. The manuscript was, he says 'surely made' for this chapel and 'most probably' written for Bartolomeo della Scala and his wife Costanza of Antioch. The sale was the first appearance of the manuscript for four hundred years. It had passed to the convent of Santa Maria delle Vergine in Campo Marzio in the late 14th century. The above-mentioned manuscript is the longest and most detailed account of the lives of Saints Theuteria and Tosca. Theuteria was an English woman of noble birth who the English King Osgualdus took a fancy too. She, having already dedicated her life to Christ, rejected him, so turning the king against her and her father. After initially hiding in a fortified tower she finally fled to Europe, ending up in Verona, where she met and spoke with Tosca, an anchoress living in in a cell outside the city, who is said to have been the sister of Proculus, the Bishop of Verona. Meanwhile the Devil had made King Osgualdus send agents to find Theuteria. When she heard this she fled back to Tosca, but the hermitage had no door, only a small window. 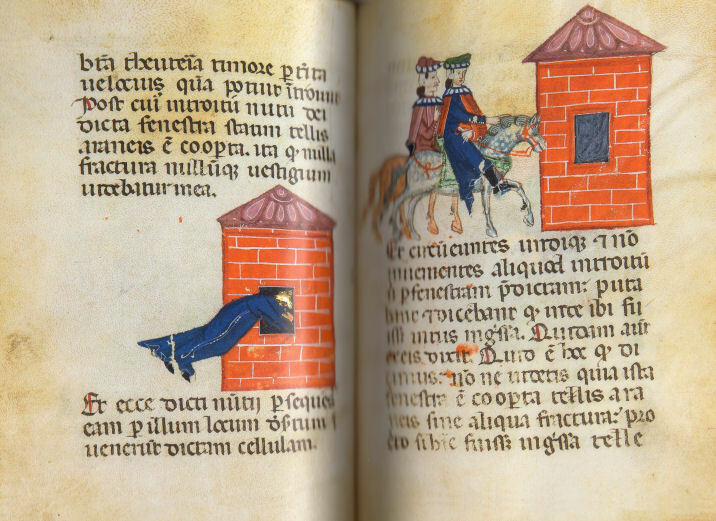 But miraculously Theuteria was born aloft and through the window, so that when the agents arrived they found no trace of her, and the window had been covered in spider webs - the scenes illustrated in a spread from the above manuscript see right. The two women became famous and their hermitage much visited, with their relics responsible for many miracles after their death. An earlier church on this site existed by the 9th century, but being outside the city walls it was burned down during the Magyar invasion of 951. 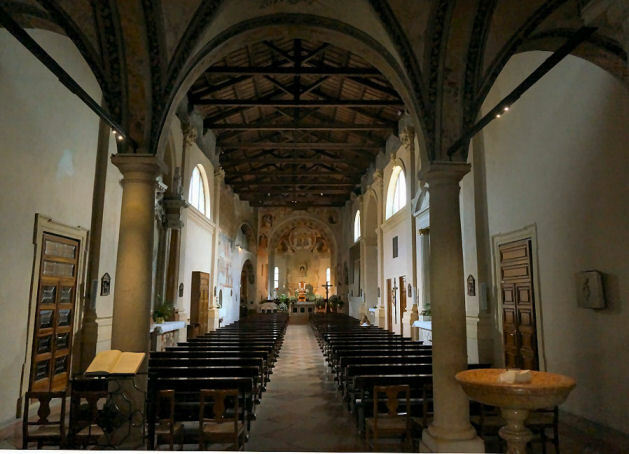 The building of this church and its Cassinese Benedictine monastery began on the 13th of October 1464. Building was completed on 6th April 1466 and an inscription inside records the date of consecration as February 14th 1483. More work in the 16th century - the interior was restored in 1510 and in 1575 the chancel was extended and barrel-vaulted and frescoed by Paolo Farinati. In 1688 the enclosed baroque courtyard was built, along with its monumental entrance archway. In 1770 the monastery was abolished by decree of the Venetian Senate, but the church and monastery were immediately purchased by Benedictine nuns from San Daniele, who settled here, carrying out renovation work on the monastery and remaining until the Napoleonic suppression of religious orders in 1806-10. Over the door in the lunette is a fresco of The Madonna with Saints Nazario and Celso by Paul Ligozzi from 1601. A nave with aisles five bays long with large square columns. In the left aisle the second chapel has a Madonna in Glory with Saints John the Baptist, Anthony Abbot, Benedict and Blaise, signed and dated of 1543, by Antonio Badile. The page bottom right is said to be the young Paolo Veronese, Badile having been Veronese's teacher (and later father-in-law) and the painting having been made during Paolo's apprenticeship. The fifth chapel has a Madonna and Child with Saints Peter, Paul and Margaret by Domenico Brusasorci, with a lunette (Christ Entrusts the Keys to Saint Peter) by him too. 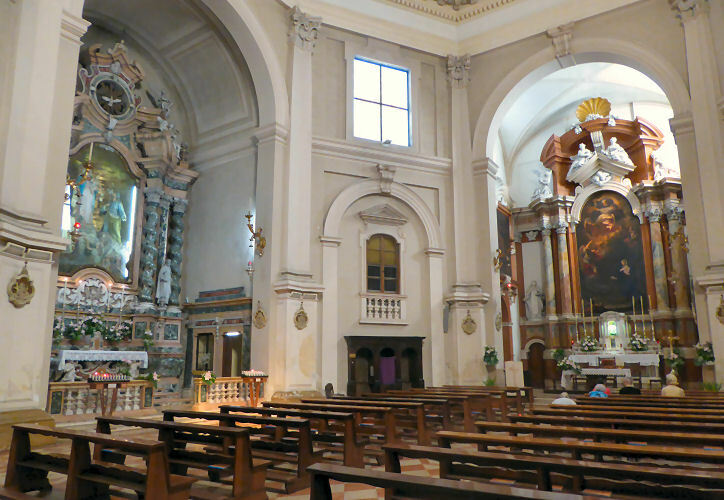 The left arm of the transept is the spectacular chapel of San Biagio (Saint Blaise) (see below right) built to house the saint's relics, which were given to the monastery in 1174 by a German crusader along with those of Saint Juliana. He had, it is said in the leaflet provided by the church, 'found them in the orient'. The chapel's decorative conception and most of its frescos, are the work of Giovanni Maria Falconetto, begun March 7th 1488, completed 1528. His work was completed by Domenico and Francesco Morone between 1497 and 1499, with contributions by Cavazzola and Bartolomeo Montagna. This chapel saw conservation work in 1996. Also here is an an altarpiece by Francesco Bonsignori (The Madonna and Child in Glory with Saints Blaise, Sebastian and Juliana, who is chaining the devil.) (this may now be in the Castelvecchio) with a predella by Girolamo dai Libri (The Miracle of Saint Blaise (where he saves a boy choking on a fish bone whilst being taken to jail), The Martyrdom of Saint Sebastian and The Martyrdom of Saint Juliana) of 1526. Too far away to appreciate. Inside the arch above (and hence invisible as the chapel is fenced off) is an Annunciation by Cavazzola. Marble altar tombs of Saints Biagio and Juliana by Bernardino Panteo. Martyrdom of two saints. The apse is frescoed by Paolo Farinati (and signed and dated 1575) also four paintings by him of Stories of Saint Celso. In the right transept is the door to the Sacristy, which has 15th century inlaid walnut cabinets and a triptych by Felice Brusasorci (Madonna with Saints Peter, Paul, Augustine and Benedict). The right aisle second altar has an Annunciation and lunette of Adam and Eve by Paolo Farinati. The fourth an Ecce Homo by Flacco, a pupil of Badile 1529-75. The first aisle has a movement-filled Conversion of St Paul by Bernardino India. The paintings on the organ shutters, above the door, are by Giovanni Battista Brusasorci, Domenico's son, and depict Musical Angels. Venetian style and built by Francesco da Castello in 1550/51. Old guide books speak of Ancient Christian wall paintings in chapel/caves carved into cliffs behind the church - The most ancient pictorial remains in the Venetian territory - and a tomb which has never been opened. A panel fragment, from a polyptych painted for the high altar here in 1500/02, depicting the top halves of Saint Blaise and a Bishop Saint (San Mauro?) by Bartolomeo Montagna (who also contributed to the frescoes in the chapel of San Biagio here) is in the Castelvecchio. Four more fragments, showing a Dead Christ Supported by Angels and three pairs of saints (two pairs full length) are still here (in the right transept?) There were originally seven panels, the central one being a Madonna and Child, now lost. Large fresco panels of The Baptism of Christ with four roundels of the Evangelists, by Franceso Morone, are in the Castelvecchio. 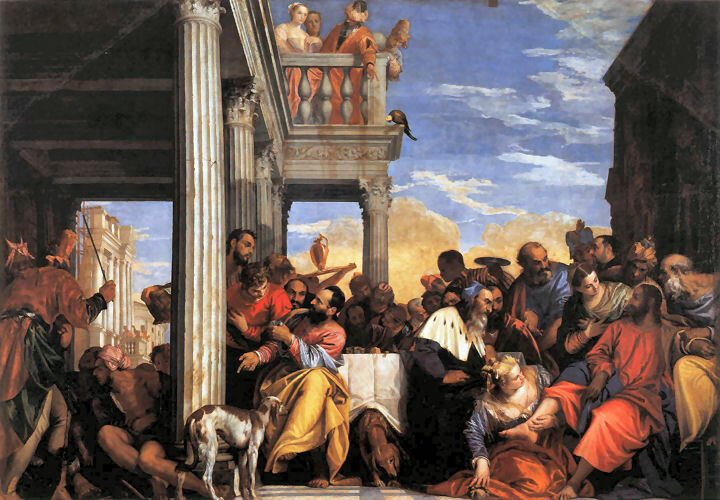 The Feast in the House of Simon of 1556 by Paolo Veronese (see above) was painted for the refectory here. It is the earliest surviving of his big feast scenes and is now in the Galleria Sabauda in Turin. A copy by Sebastiano Ricci, made in 1716-18, is in the British Royal Collection. A Madonna and Child in Glory with Saints Blaise, Sebastian and Juliana by Francesco Bonsignori (1514/19) formerly in the Capella di San Biagio here, is (probably!) now in the Castelvecchio. As is a Mystic Marriage of Saint Catherine by Pasquale Ottino. An antiphonal from this church illuminated by Girolamo dai Libri and his father's workshop is now in the V&A's National Art Library (MSL/1866/4929) in London. A date of inventory of 1492 is noted on the first leaf. Legend has it that Christianity was introduced to Verona when Saint Syrus celebrated mass here, having stopped off on the way to becoming the first bishop of Pavia. Legend also states that he was the small boy who gave the five loaves to Jesus during the miracle of the multiplication of the loaves and fishes. The dedication to Saint Libera was added in the 14th century. Now part of the Roman Theatre complex, the church was founded in the 10th century, then passed to the Brotherhood of the Most Holy Body of Christ in 1517. The church was later much altered, especially in the 17th and 18th, so the façade has a baroque staircase but the original 14th century doorway and porch. Very baroque - there are four nave altars and two side chapels. The first on the left has Madonna and St Gaetano of 1751 by Giandomenico Cignaroli, who is buried here. Also from the 18th century are the very decorated high altar and presbytery, the German-made wooden choir stalls behind (1717-1720) by Andrea Kraft, Petendorf and Siut, and an Annunciation painted by Ridolfi. Four damaged fragments in tempera on panel by Francesco Morone, showing the Madonna, Saint Paul, Saint Anthony of Padua and Saint John the Evangelist are in the Castelvecchio. A still partially polychromed statue of Saint Liberata by a sculptor from the circle of the Master of Sant'Anastasia is in the Castelvecchio. Thursday, Friday, Saturday, Sunday 10.00 - 5.30. A church and monastery has been here since the late 11th century, built by Vallombrosian friars, a stricter order on Benedictines, from around 1073. The church was consecrated on 12th January 1117. The chapel north of the chancel remains from this first Romanesque church, as does the campanile. Parts of the portico date from the 12th to the 16th centuries, a period during which the church underwent various building works. 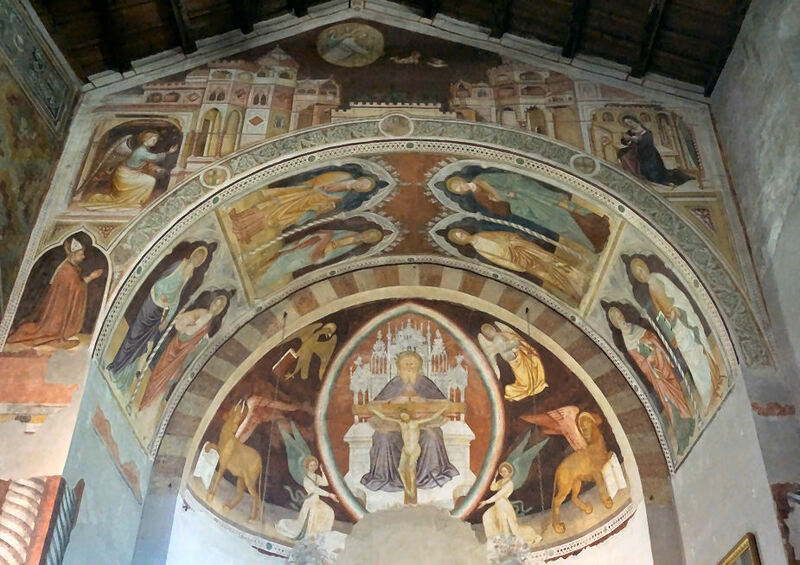 In the 14th century Abbot Bartolomeo lengthened the building and commissioned the Trinity Supported by Angels in the new apse, as well as the Coronation of the Virgin with Saints by Turone di Maxio now in the Castelvecchio museum. The façade under the portico dates from enlargement in the 16th century. The Vallambrosians left in 1441 and from 1536 the complex was used as a refuge for women. A loggia with a grating was built for them in the church. The church had fallen into ruinous disuse by the 19th century. Both cloisters and one of the east-end chapels was destroyed during bombing on 6th April 1945. The late 20th century removal of whitewash led to the subsequent restoration of discovered frescoes. Entry is through an odd large porch (see above) suggestive of a small cloister. The interior is long and narrow with a deep organ gallery over the door and much old fresco work. There are a pair of flanking altars with frescoes as you emerge from under the organ gallery. On the left is a very damaged Mystic marriage of Saint Catherine. On the right, one under the gallery, are works by Domenico Brusasorci and Felice, his father. Panels of 14th century frescoes on the left hand wall as you approach the east end, dated 1359, and over and in the chancel. The top row on the left wall depicts Stories from the Life of Christ, the lower Stories from the Life of Saint Martin. The Annunciation on the arch over the apse is said to be by Martino da Verona, the courtly Apostles in the vaults the work of Jacopo da Verona. Abbot Bartolomeo is depicted beneath Gabriel in The Annunciation, the whole wall seemingly built asymmetrically to fit him in (see below right). A pair of sweet little transepts flank the apse. The irregular shape of the right-hand one is said to represent the extra pressure imparted on the right-hand side of the cross by Jesus' shoulder. On right hand-wall opposite the wall of frescoes are three unframed canvases, two by Brusasorci and one by Jacopo Ligozzi. 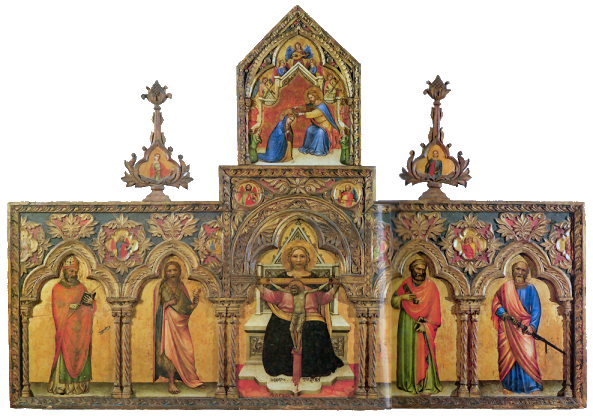 The Trinity Polyptych by Turone di Maxio (see below) signed and dated 1360, depicting the Trinity flanked by Saints Zeno, John the Baptist, Peter and Paul, from the refectory of the convent here, but probably originally on an altar in the church, went to the Castelvecchio in 1812. It had two more panels depicting The Annunciation, which are now in a private collection. A Crucifixion fresco panel (now in three parts) by the Circle of Altichiero, from the cloister here, has been in the Castelveccio since 1879. Augustus and the Sybil, a rare work on panel by Gianmaria Falconetto, which looks very like a stage set, now in the Castelvecchio, came from the refextory of the convent here. Part of the original building, the tower rests on a foundation of stones from Roman ruins. 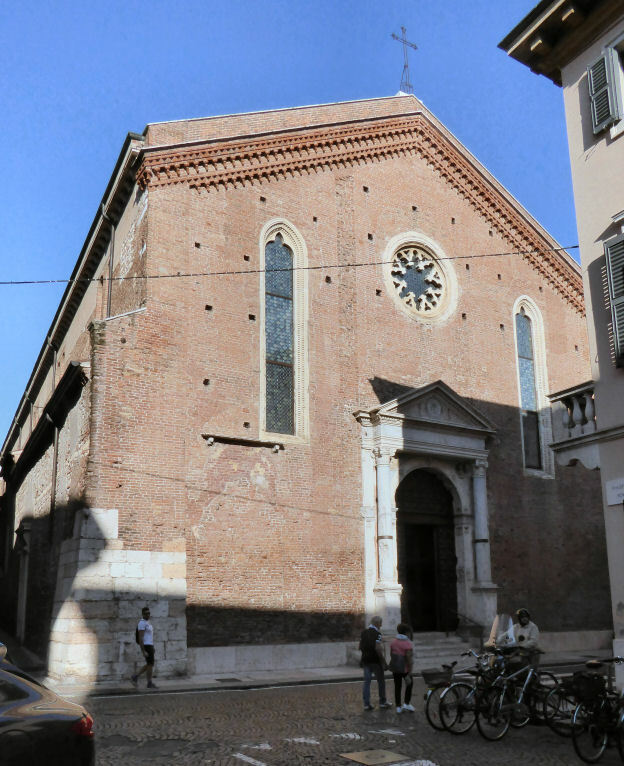 Tradition has it that this church was built in the 5th century, and was the cathedral of Verona from 412 to 750, erected on the burial site where 40 Veronese martyrs were interred, and that it was destroyed by Theodoric. But the original church here was likely a cemetery chapel housing the relics of St Stephen. Following this rebuilding in the 8th century it would have been rebuilt again in the 10th century as, being outside the city walls, it was burned down during the Magyar invasion of 951. Following the earthquake of 1117 it was rebuilt yet again. The apse was remodelled in the 14th century. Flat-roofed with chunky square piers dividing the nave from the aisles. The right aisle has a baroque chapel from 1619-21 with gilded mannerist stucco attributed to David Reti. 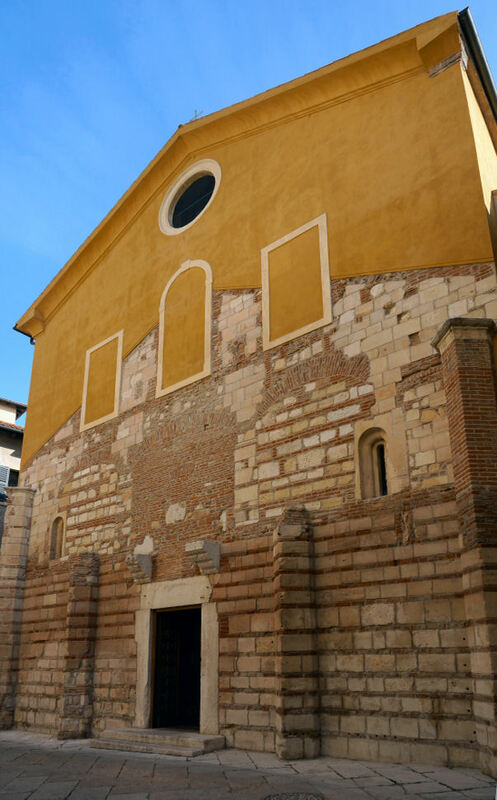 This is Cappella Varalli, or The Chapel of the Innocents, built to celebrate the housing of the bones of five early bishops (Florentius, Vindemalis, Maurus, Andronicus and Probus) and the relics of the forty martyrs of Verona, put to death by Diocletian, in the crypt here, and the children murdered by Herod. 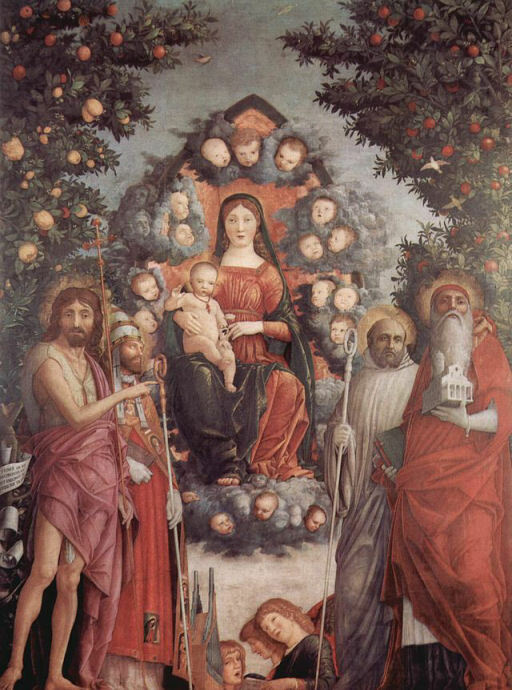 The altarpieces, from the left, are The Forty Saint Martyrs of Verona by Alessandro Turchi (known as Orbetto), The Massacre of the Innocents by Pasquale Ottino, and The Five Bishop Saints of Verona by Marcantonio Bassetti. Ottino also painted the panels in the stucco of The Assumption and Virtues. In the left aisle are three much less interesting interconnected chapels, the central one being deeper. By the stairs down to the crypt on both sides are 13th century monochrome frescoes by Battista del Moro of St Stephen Ordained as a Deacon by St Peter and The Burial of St Stephen. The same artist frescoed the lunette above the side door. On the right at the top of the wide staircase up to the very-frescoed crossing is a 14th century polychromed statue of Saint Peter Enthroned brought here by the Austrians from the nearby demolished church of San Pietro in Castello. It is attributed to Rigino di Enrico. The apse has an unusual raised vaulted ambulatory possibly dating from the 10th century and a bishop's throne which may be from the 8th. The frescoes generally get later as they get higher. To the left of the altar is a fine Coronation of the Virgin above an Annunciation, both by Martino da Verona from the late 14th century, amongst other earlier bits from the 13th. The illusionistic and somewhat strange frescoes in the dome and lateral spaces, with saints' attributes emerging from clouds, angel musicians and fighting archangels, (see below) are by Domenico Brusasorci (c.1533). In the right transept is a panel depicting Madonna and Child with Saints Peter and Andrew by Giovanni Caroto (1543). In the left is Saints Helping Christ with the Cross by Domenico Brusasorci (1543). Fragments of 12th and 13th century frescos and elements of the original church are to found in the 10th century crypt. If it's open. Many bishops of Verona are buried here, along with the forty martyrs put to death during the reign of Diocletian. Also the tomb of Galla Placidia, the daughter of the Emperor Valentinian III, the granddaughter of her more famous namesake and probably the last Western Roman Empress known by name. An early mosaic floor taken from this church is now in the Archaeological Museum up the hill, but I couldn't find it there. A large panel depicting the Madonna and Child with Saints John the Baptist, Jerome, Francis Placidia, Maurus and Simplicio by Nicola Giolfino are now in the Castelvecchio. Pasquale Ottino Assumption of the Virgin in Castelvecchio. Fresco fragment of Madonna and Child with a worshipper in Castelvecchio by Stefano da Verona. Mand C with Saints Nicola and Andrea and a Worshipper by Giovanni Badile, in Castelvecchio. Nuns from here moved to Santi Nazaro e Celso in late 18th century. Sebastiano Ricci David Declines Saul's Weapons in Castelvecchio. Father Giovanni da Paternò of the Order of Friars Minim of San Francesco di Paolo came to Verona in 1593 with the aim of bringing his order to the city. With the financial backing Counts Massimo and Agostino Giusti and Giulio de 'Cagalli he built a church in 1596 in Campo Marzo dedicated to San Francesco di Paolo along with a monastery, restored and expanded to the mid-18th century. In July 1806 the monastery, which then had only six monks and two lay brothers, was suppressed. Part of it's cloister is now the library of Frinzi University. Nicola Giolfino Madonna and Child called The Madonna of the Jasmines, from a side altar here, in the Castelvecchio since 1812. A triptych of the Madonna and Child with Saints Blaise and Sebastian by Antonio Badile II has been in the Castelvecchio since 1812, as has another depicting the Madonna and Child with Saints Peter and James by his studio. Had the Madonna and Child with Saints Rocco and Sebastian (The Maffei Madonna) by Girolamo dai Libri, which was in the Maffai chapel here, but since 1812 is in the Castelevecchio. The same family had commissioned his famous Nativity with the rabbits for their chapel in Santa Maria in Organo, now also in the Castelvecchio. Francesco Morone's Virgin and Child Enthroned with St Zeno and St Nicholas, which was on a side altar here dedicated to San Zeno, is now in the Brera. Originally an oratory/parish church probably Romanesque in design, dedicated to Saint Sebastian, with a hospital, built in 932 Originally. 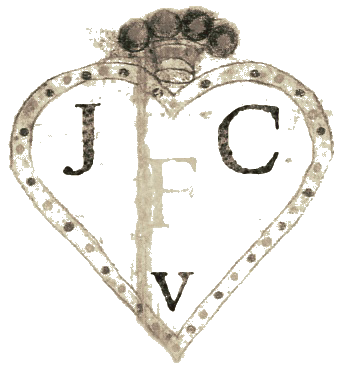 It passed to the Jesuits 8 February 1578. On April 24, 1591, the Jesuits asked the Venetian Senate of the city to enlarge the church, which was still unfinished. They agreed, but with the interdict of Pope Paul V against the Venetian Republic of 1606, the work was suspended, never to resume. Following the abolition of the Jesuit order in 1773, the city of Verona purchased the complex from the Venetian Senate for 30,000 ducats in September 1774. Closed by Napoleon, the convent was used as a library and gymnasium. During the Austrian occupation the church was reconsecrated. The Jesuits returned in 1842, to run the church the gymnasium. They remained openly until 1848 and clandestinely until 1866, with the retaking of Verona by Italian troops the church was again deconsecrated. The church building was almost completely destroyed by allied bombing on 4th January 1945. The library reopened with rebuilding after the war. Marble blocks from its façade were used on the church of San Niccolo. Giambattista Tiepolo Episode from the Story of the Maccabees an early work, and part of a high freeze, now in Castelvecchio. A pair of panels of The Annunciation, maybe organ doors, by Claudio Ridolfi in Castelvecchio. Also St Anthony Reading by Marcantonio Bassetti and The Herald Angel by Claudio Ridolfi. 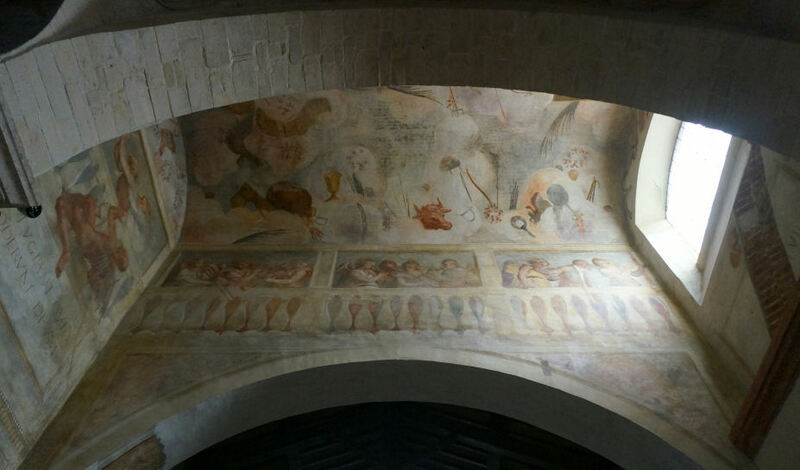 19 14th c fresco frags by the Second San Zeno Master in Castelvecchio. Built in 1194 in Borgo Ognissanti can still can be seen today amongst Military buildings, it was rebuilt by Benedictine nuns in 1743. Church and convent suppressed in 1806 and used as barracks. A Flagellation of Christ an early work by Alessandro Turchi in Castelvecchio. Had a Baptism of Christ (also known as the Baptism of the Ibis) over a side latar, painted by Girolamo dai Libri, in Castelvecchio since the church was suppressed and demolished in 1812. Had the huge Adoration of the Shepherds by Moretto, commissioned by Mario Averoldi, a relative of Bartolomeo Averoldi, Abbot of the Umiliati friars, now in the Gemäldegalerie in Berlin, which also had a companion panel, the The Madonna in Glory with Saints Elizabeth and John, destroyed/missing since 1945. 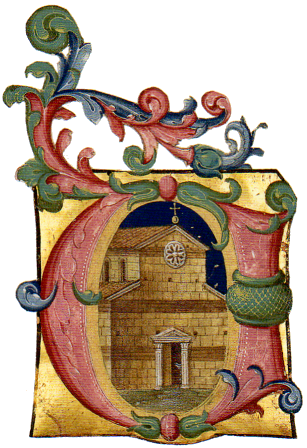 Fed up with paying rent to the monastery of Santa Maria in Organo the order of Gerolomini (Hieronymites) needed to build a church of their own. 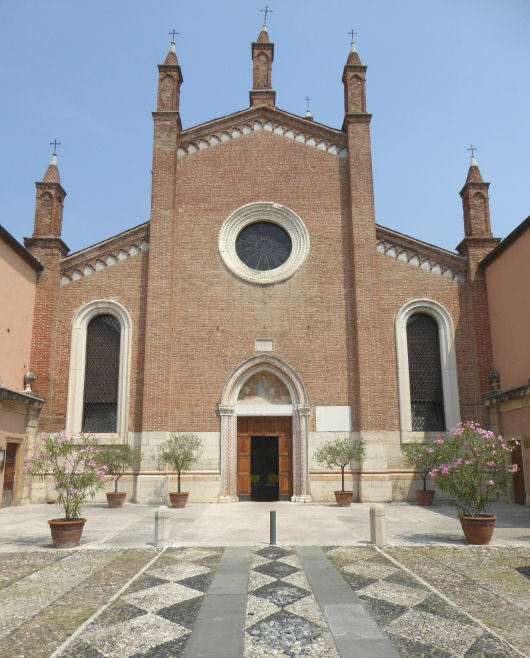 Construction began in 1487 and was completed in 1512 with the church dedicated to Santa Maria delle Grazie, which became known as della Vittoria Nuova. Today nothing remains except a small cloister and a well-head in a building that currently houses the University of Verona's Faculty of Economics. Saint Jerome between Saints Paul and Francis of Assisi, from the chapel of Saint Jerome here, by Liberale da Verona, is now in the Castelvecchio. Francesco Morone's Trinity Altarpiece also in the Castelvecchio, since 1812, was from the Fumanelli Chapel here. 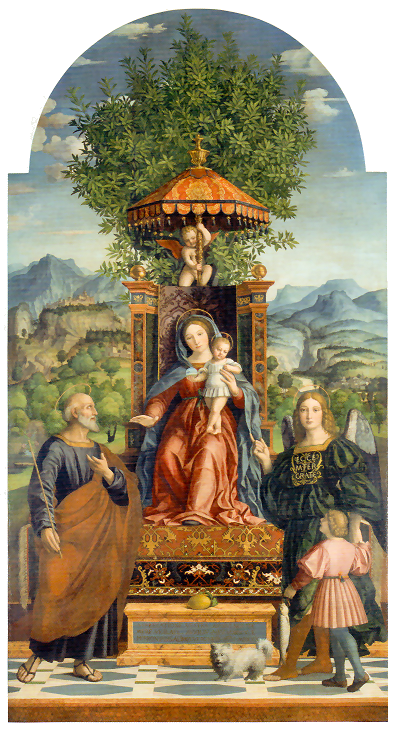 Had the late and verdant Madonna and Child with Saint Joseph, the Archangel Raphael and Tobias (The Madonna of the Parasol) (1530) (see right) by Girolamo dai Libri in Castelvecchio since 1812. A predella panel of The Visitation is in Grenoble. Also a Lamentation, a very early work by Paolo Veronese which was in the sacristy here, now in Castelvecchio. (They call it a Deposition.) Removed from the church to Paris in 1797 and returned to Verona in 1816. Had Madonna and Child with Saints Peter and Andrew, (also known as The Madonna of the Oak Tree) a late work by Girolamo dai Libri now in the Castelvecchio.